Here, we see the Tasman Salt in its natural habitat. Nature photo courtesy of dan5o. The search for the perfect companion blade to the Spyderco Military full-size folding knife continues. Today’s contender is the curiously shaped Spyderco Tasman Salt, serrated. As the Military is plain edge, I went serrated for this companion blade, to have the versatility of both edges at any given time. Different tools optimized for different tasks. 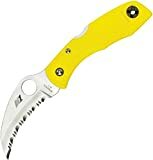 My search for the ideal serrated companion blade took me to the Spyderco Dragonfly… and it was great. But in several knife forum discussions, I was strongly encouraged to check out the Tasman Salt by veteran users. And after getting the Dragonfly (SpyderEdge) recently, I was impressed with the Spyderco serration design, and decided to try a Tasman Salt Hawkbill – Serrated. It’s only been a few days, so this is very preliminary… but wow, the Spyderco Tasman Salt is one ridiculously useful and handy knife. Just for general stuff, packages, etc. The hawkbill is modeled after an animal’s claw, and is particularly suited for “pull cuts”, not push or thrusting. Imagine having a metal claw… that’s perhaps a good analogy to how wielding this knife feels. The hawkbill claw design is particularly handy for “opening things up”. Feed it some of that particularly hard clamshell packaging, and the Tasman Salt will eat it up like no plain edge or traditional knife design. And a totally different example… I was getting ready to put a raw chicken in the crockpot yesterday, and the chicken is frozen and shrink-wrapped. This curved Tasman Salt blade was PERFECT for getting that shrink-wrapped plastic off. Side note: I cook homemade dog food for my pups, and bone broth is VERY healthy – get my homemade dog food recipes here. If you like playing with your knives, flicking them open, closing, flicking open, and so on… use a different knife. DO NOT attempt to close a hawkbill or karambit style knife one-handed. Yes, you can probably do it, but it may also go poorly for you. Excellent little knife. Get one.